Our goal with each product we offer never changes — provide the best solution to our customers through pairing excellent service with reliable, high quality products. For that reason, we partner with ClimateMaster to bring you the best heat pumps available. Choosing to work with ClimateMaster was easy — their geothermal heat pumps can reduce the average household’s energy cost by 80%, making it an intelligent solution for your home and your wallet. They also offer a wide variety of product solutions to accommodate unique installations challenges in both new and existing installations. The efficiency of ClimateMaster’s heat pumps earned their Tranquility Digital Split Series the Most Efficient ENERGY STAR certified products label in 2017. 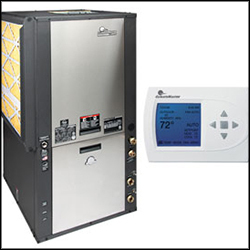 We understand the stress and uncertainty that comes with purchasing a new heating and cooling system. You can rest easy knowing that you hired the professionals at Pro-Tech to take care of you and your family. For more information on the high quality heat pump systems offered by Pro-Tech Heating and Cooling, please contact us here or call us directly at 616.453.5000.